It is soo nice to finally get your lovely card. — mentioned this card for me before, and I told her that I haven’t received it yet. There was a lot of anticipation on my part to get your letter. From what — told me, and what I read in your card I know you were lovely people. I look forward, in the near future, to meet you, and to get to know your family better. It’s reassuring for me and heartwarming to know that there are people, other then your family, who care about me. When it gets lonely here for me, I always remember that there are wonderful people who care about. And it’s always something to look forward to, is meeting you. Should and when that day comes. I would love to see Amsterdam. I know it is beautiful, especially in the summer time. Maybe you can give me a tour when that day comes. This will be something we both look forward to. Being back in Canada is, as you said, a wonderful thing. As big or difficult change may be, it’s worth it. The light of goodness out light shadow that might be. There are to many good things in this life (as hard as it might be) to worry or even care about the bad thing. Things are what we make out of them. Prison can be a deprivation of freedom, or a time to enlighten ourselves. For me it is the latter. Before I run out of space, I wish you a wonderful holidays and a a happy new year: filled with joy and happiness. Till next time. I send you my warmest greetings (for your cold winter in the Netherlands) and best wishes. Take care and thanks for your kindness towards me and my family. Mr. Khadr is an amazing person. I think that one day, a book will be written about him. I wish him the best. 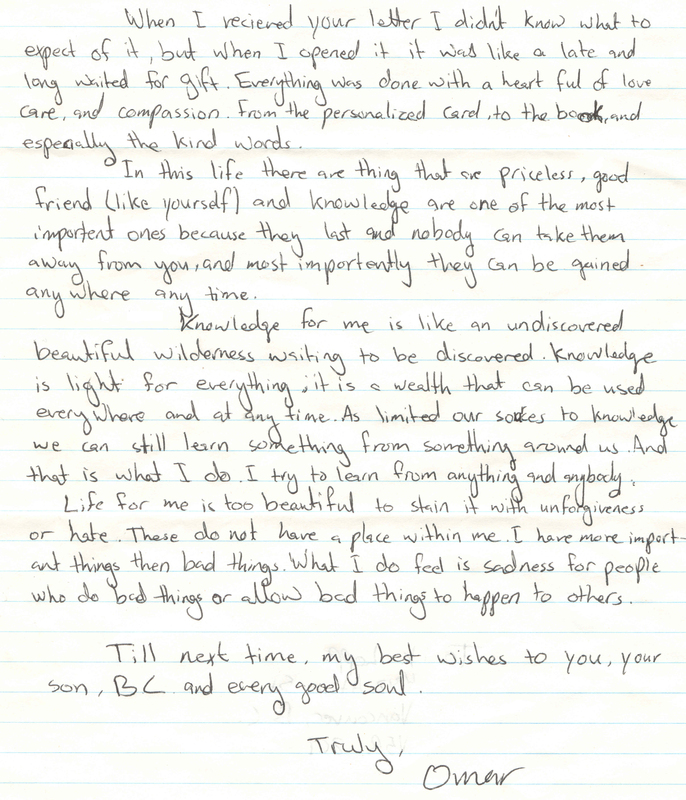 Touched by Mr. Khadr’s handwritten letter. It truly is remarkable for him to come to the place where he is able to express sincerity and wisdom beyond his age, especially given his loss of innocence at such early age. 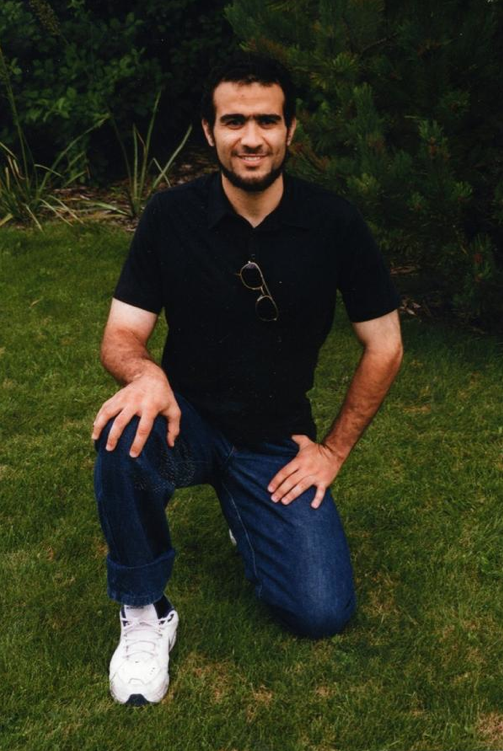 Having endured years of torture and isolation in darkness, Mr. Khadr speaks of gratitude! Mr. Khadr, I salute you for your eloquent expression of thoughts. Thank you Sunny for your kind words. I’ll pass your message on to him. I too have received cards and letters from Omar over the past year similar to those quoted above. I am always amazed at the grace and courage of this young man who has found a way out of darkness and sees only light. I can’t wait to someday meet him and hope that daycomes soon. He is truly a miracle and we can all learn from him. I know his future will be bright. That is wonderfully said. Thanks for writing to Omar! I’m just in love with Omar ♥ pray to Allah everything will be fine. Insha Allah. I live in Victoria, not Edmonton but all the letters I have received from Omar reflect this same appreciation and kindness. I often say Omar practises “radical forgiveness”. He has taught me more than I could ever give him. What a gift! that is so beautiful P Houston. Can we get in touch? Can you please email me at freeomarkhadrnow@gmail.com? where and how do you send letters? Hi, please see under the ‘How to Help’ tab for Omar’s address and the dos and don’ts for sending a letter. Thank you for your support for Omar. I was wondering if there is a current forwarding address (as of June 2015) to send encouraging cards or letters to Omar now that he is out on bail??? Any feedback would be appreciated. What a remarkable, inspiring, upright, dignified man. There’s few people who can last an ordeal like what he went through. Come to think of the world there’s ordinary people, then there’s real men, but then there’s legends; here is a legend. As someone who has been corresponding with Omar these past two years I totally agree. I have a friend who deals in the deeper things in life and she believes that Omar is a prophet who has been sent to teach us. Who knows? I looked at the previous comments on how to contact Omar Khadr but it was dated to last year and now he is living with Dennis Edney, God bless him for all his help getting Omar Khadr out. Many years ago when I first heard about Omar Khadr’s story I was in the library of my university and was reading the book written about him I only could read a few pages before running out and crying amd screaming just thinking about what he went through. He is truly amazing and anyone can fall in love with his smile. He has always been in my heart since day 1 when I found out about him. I made a promise to myself that if he ever got out I would visit him. How do I send a letter now? Is it possible to go meet him? Omar and his story has truly touched the lives of family and I. I don’t know why, but its like he’s a part of my family and we care for him like we would about anyone at our home. I look him up every day online to see any new developments or just simply check what he might have been up to! Omar proved not only to be a remarkable young man, but the definition of a true Canadian ❤ Omar, you make all the Canadian proud and may you continue to be as amazing as your words and actions are! Cant wait to have you back in Toronto and maybe see you one day soon! If I send a letter to Omar, does he real all of them and does he write back?